The humdrum of life stresses us out often. Experts suggest doing meditation to live a healthier, balanced life. Unfortunately, given the fast pace of our lives, most of us don’t find time to do meditation. So, what’s the way out? Well, meditation apps are the answer to combat stress and make you feel relaxed. Besides teaching relaxation skills, these mobile apps facilitate new thinking and even offer suggestions to carry out healthier activities. Here are some of the best meditation apps to take your attention inward while on-the-go. 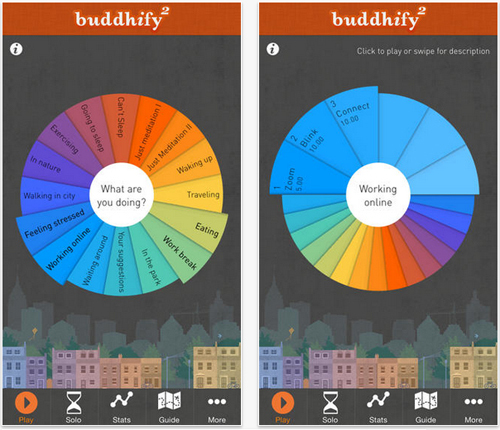 Priced at just $ 2, Buddhify is equipped with amazing meditations and graphics to rejuvenate your life. Customize sessions, select tailored guides while you are walking or traveling. It even gives you 100+ tips to stay mindful. It has 40+ custom guided meditation tracks ranging from 5 to 20 minutes, a solo meditation timer, and check-in system to measure your performance. This iPhone app lets you bring the entire power of meditation in your life. More than 6 million people across 111 countries have relied on the renowned Silva Centering Meditation Technique since 1964 to improve the overall quality of their lives. Practice creative visualizations and even change habits with this wonderful iPod & iPad optimized app. And, it’s available for free! Get access to guided meditation sessions for free! You can even subscribe to its paid version to get premium meditations. It includes an easy-to-follow program to help you learn meditation. The sessions range from 2 to 30 minutes. So, whenever you feel the need for a break, this app is your answer. It also has about 16 music tracks by Kip Mazuy. You can even select from 10 beautiful nature scenes. Its 7 steps of calm focus on guided meditation like ‘mindset’, ‘breath’ and ‘posture’. Unwind yourself with this free android app and learn Qi Gong, a basic form of Tai Chi via video tutorials. Learn muscle relaxation, guided imagery and breathing with the help of audios including sounds of mountain cabin, meadows, rainbow of emotions etc. It even helps you learn cognitive behavioral theory and helps manages stress too. If you are battling insomnia, this app is worth giving a try. Get complete meditation and relaxation training with this app when you find yourself going overboard on a certain part of your life. It gives you quotes to meditate on. There’s also a timer to measure your meditation’s duration. There are 10 levels of enlightenment. The app also gives you notifications when you skip meditation. Listen to those tranquil nature sounds to relax your mind, body and soul. You can go for the 5 minute Breath Awareness Guided Meditation to get relaxed during the lunch break. There’s also a 13 minute Deep Rest Meditation to fall asleep after you come back from office. The 24 minute Whole Body Guided Relaxation is the best meditation to bring you back to life. The app also offers written meditation tips. Available for only $.99, Simply Being features a woman’s soothing voice to offer you 5-15 minutes of guided meditations. You have the option to select voice-only or include music & nature sounds such as stream, rain and ocean. A nice way to relieve your stress levels after a tough day! Go for this app if you want to get a good sleep after a tiring day. Get guided meditations to relax your mind and body. Just listen to the audio and you will be fast asleep. A great solution if you are suffering from insomnia. Try out these apps and find your way through a peaceful, relaxing, stress-free life. By: Emily Romanoff is community manager at GreeneStone Muskoka, specialized drug rehab centers in Ontario. She would like to explore her healthcare knowledge to others. Benefits of Meditation Seniors Can’t Do Without!